I made these recipes three separate weekends of ~nothing but apples~ left in our fridge. I mostly whip stuff up during Monday mornings, and just decided to steer away from usual breakfast staples like eggs, cereals, and more eggs. After rummaging the fridge, I decided to prepare something out of the ordinary, and the challenge presented itself in the form of apples. If you're planning to eat healthier since it's a turn of a new month, this may be a good way to start. So just how do you incorporate apples into your breakfast? This one's super easy. It's great for those mornings when you're in a rush but want something to eat that's sweet and savory at the same time. You may think that apples and cheese is a weird combination, but it's really a party in your mouth! Kind of like peanut butter and cheese, or peanut butter and banana! I forgot to bookmark the link where I got this recipe, so I'll just list down the ingredients I used and how I made them. You can first toast your bread in a traditional toaster for a few minutes, then lay slices of cheese on it. Microwave the sandwich so that the cheese would melt faster. If you don't have a microwave, you can still use the toaster but I think it would take a longer time. 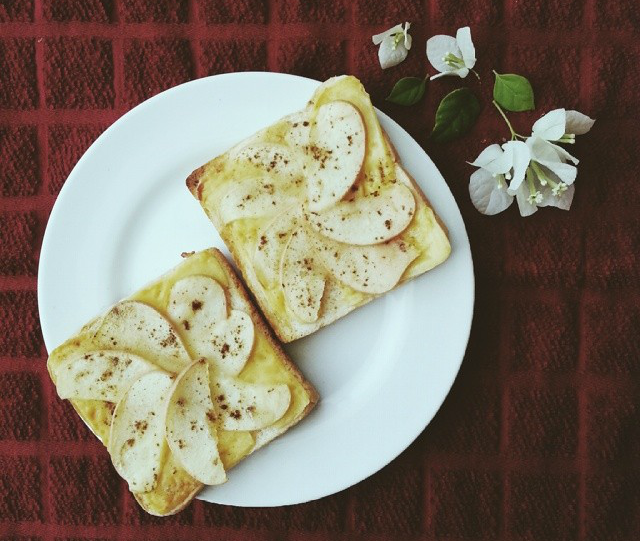 You can now top the toasted bread with melted cheese with the apple slices. (Note: Don't slice it too thinly as it would most likely end up soggy.) You can serve it directly this way, but what I did was I toasted it a little bit more to achieve that chewy, tarty texture of the apple when you take a bite. Drizzle a bit of olive oil on top. Add a dash of salt and pepper. I also added a pinch of the 5 spices powder we had at home for a twist in flavor. 1. Combine potatoes, apples, and 1 teaspoon salt in a colander. Let stand 20 minutes, pressing occasionally with the back of a spoon until barely moist. Combine potato mixture, remaining 1/2 teaspoon salt, and pepper in a large bowl. Add flour to potato mixture; toss well to combine. 2. Heat a skillet over medium-high heat. Add 1 1/2 tablespoons oil to pan, swirling to coat. Add potato mixture in 1/3-cupfuls to pan to form 4 latkes; flatten slightly. Cook 6 minutes on each side or until golden brown. Remove latkes from pan; keep warm. Repeat procedure 3 more times with remaining oil and potato mixture. Serve with sour cream. Note: The particular recipe I used as reference didn't include onions but other recipes online seem to so you may try that as well. Don't forget to use a scoop or spoon when putting the batter on the skillet so you get consistent sizes. You may have to adjust the potato-apple ratio according to your liking. The apple flavor wasn't as evident as I expected but it turned out really great nonetheless. 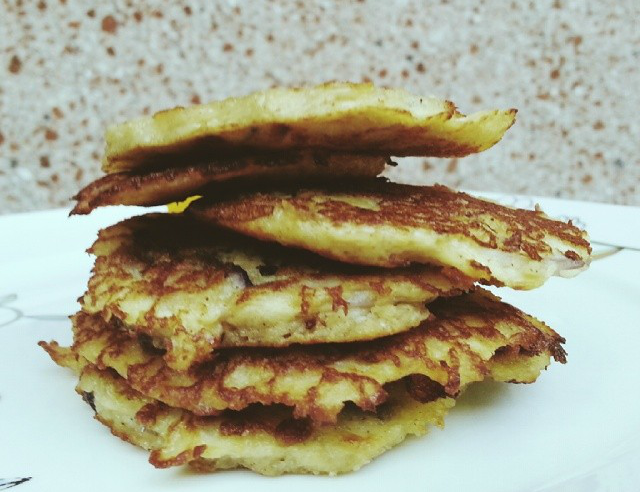 A good way to liven up the usual potato pancakes! Slice the apples about 1/8inch thick. If you opt it to be thicker, it will yield crispier pancakes. It's really up to you. In a mixing bowl combine the Maya Hotcake Mix, eggs, water and oil. Heat your nonstick frying pan to medium heat. Dip apple rings in the pancake batter and cook each one in the pan for 2-3 minutes. Remove pancake from skillet and drizzle with maple syrup on top before serving. Note: You can also add cinnamon or nutmeg for variety. I always eat pancakes with butter, so I had to put a cube of it on the side. Since apples are really not that sweet, you can also add vanilla to the batter or sprinkle confectioner's sugar on the pancake after frying.